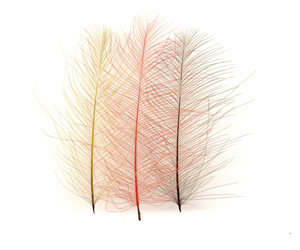 These CDC feathers are hand selected, hand died and hand dried. CDC known also as Cul de Canard are collected around the oil gland of the duck ( wild or domestic bird ). It does not mean that oily aspect is the main factor of floatability.The first reason these feathers float, is their special structure, the multitude of fibers and ramifications. You don't need chemical substances to improve floatability – the best you can do is to dry the CDC fly with an AMADOU patch.